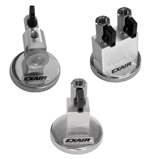 EXAIR offers a wide variety of tools to help you get the best performance out of your air nozzles and jets. Whether it's to improve the positioning of your air nozzle or to reduce air consumption, EXAIR has the accessory for you! For applications where frequent repositioning of the Air Nozzle or Jet is required, Flexible Stay Set Hoses are ideal. Simply mount the hose in close proximity to the application and bend it to aim the airstream at the target. Since the hose has "memory", it will not creep or bend. It always keeps the aim until physically moved to the next position. Magnetic Bases are suited to applications where frequent movement of the Air Nozzle or Air Jet is required. The powerful magnet permits horizontal or vertical mounting. A shutoff valve is provided that can be used to infinitely vary the force and flow. EXAIR's Swivel Fittings make it easy to adjust the position of Air Nozzles and Jets. The Swivel Fittings permit a movement of 25 degrees from the center axis for a total movement of 50 degrees. Type 303 Stainless Steel. 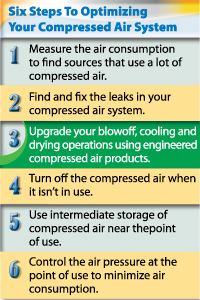 Not really sure which Air Nozzle or Jet is best suited to your application? EXAIR's Blowoff Kits provide a complete assortment of Air Nozzles and Jets for you to experiment with.